We want to help all the world's children have the same freedom and independence as do Dutch children. At this time, children in many nations have less freedom than they used to because parents fear for their safety when they are outside of the family home or the family car. In order for this to change, parents must become involved and demand that our streets are transformed to give the same freedom to today's children as their parents and grandparents benefitted from. The relative lack of freedom of today's children relative to their parents is in part responsible for the obesity 'epidemic' which is sweeping the western world. There are also social problems due to children not having independence from a young age and as a result not being prepared to take their rightful place in the world. UNICEF consistently rates Dutch children as having the best well-being of all the world's children. We want all children in all nations to have the same opportunities as Dutch children. Children should be able to use the streets outside their homes to play and also to travel. This will take infrastructural change. Unless through traffic is restricted and a safe network of walking and cycling routes is accessible from every home this freedom will remain elusive. We use The Netherlands as an example of good practice because this country has the best existing network and because UNICEF rates the country so highly. Can children walk to make all their journeys ? Walking is valuable and already used in many places to make many shorter journeys. All of us are pedestrians already for at least part of some of our journeys. However while walking is healthy, it's only practical for short journeys and therefore serves best an adjunct to other transport modes. Walking is important, but it can't give children all the freedom that they need. How about public transport ? Public transport requires that the passenger wants to go where the route chosen by the operator goes. Public transport stops at whatever time of day the operator decides to run the last vehicle. The costs are high in comparison with the average child's pocket money and parents may not be able to afford to pay to give their child complete freedom by public transport. Also, of course, using a bus, tram or train results in getting about the same amount of exercise as sitting in a car. Public transport is important, but it's not suitable to give children all the freedom that they need. Why are bicycles important ? Scene outside a Dutch primary school. Walking and cycling are both important. Bicycles offer children freedom. We do not, of course, advocate letting very small children travel long distances on their own, however as children grow they are capable of safely travelling further from home if given the right conditions. Do you remember your first bicycle ? Many adults have fond memories of the adventures that they had with their first bicycles. Unfortunately, children in many nations no longer have this experience of freedom and independence because roads have become jammed with cars and parents no longer think it safe for their children to cycle. We are parents too and we don't judge other people for trying to take the best care of their children. What can we learn from the Dutch ? UNICEF rate Dutch children as having the best well-being in the world. 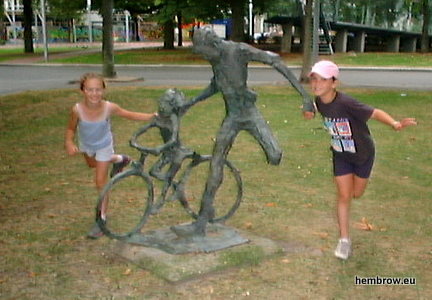 This comes in no small part because Dutch children have considerable freedom to roam. They do so on their bicyles. This is possible not because of training or because the Dutch are especially fearless, but because the entire country has been transformed in order to make cycling into a safe and pleasant experience for children as well as for adults. The transformation of The Netherlands from being dominated by cars to having the highest cycling modal share in the world came about in part as a result of the "Stop de Kindermoord" ("Stop Child Murder") protests in the 1970s. The period from the 1950s through to the 1970s saw car usage rise quickly in the Netherlands. With the rise of the car came an alarmingly high number of serious injuries and deaths of children. Parental pressure called for streets to be transformed to be safe and this was achieved by building an extensive network of cycle-paths and closing many streets to through traffic. The result was a remarkable reduction in deaths and injuries amongst children and a greater confidence amongst Dutch parents so that they could give their children the independence they need. The same type of mass protest for children to be able to play in residential streets, walk short distances and cycle slightly longer distances, all in complete safety, could transform other nations and help millions of children to have better lives. It is generally known around the world that Dutch children cycle to school. However, it's less well known how they do this. In fact, many primary school (5 - 11 year old) children, especially the younger ones or those who live nearby, walk to school. 49% of primary school children cycle each day. The average age for independent travel to school by Dutch children, by foot or by bike, is 8.6 years. Secondary school children (11+) cycle much more. Distances are longer and the bicycle is attractive because it offers a far shorter travel time. At many secondary schools outside of the big cities, more than 90% of children arrive by bicycle, even though it is very cold in the winter. Dutch children, even in primary school, don't only cycle to get to school but having arrived at school on their bikes, children quite frequently leave the school grounds with their teachers by bike in order to go on school trips, a whole class at a time. Cycling gives Dutch children a degree of freedom which children elsewhere no longer experience. Dutch research in the 1970s demonstrated that people are not willing to cycle through traffic to rare examples of good cycling infrastructure. To achieve a high cycling modal share requires that attractive conditions must exist as a very dense grid across the nation and go to every home, every school, every workplace, every park and every city centre. This goes double if the aim is that parents will find the quality high enough that they approve of their children riding their bikes. This is a long term project, but will not take as long as many people think it will. In the Netherlands it took less than ten years before the results could be seen and children began to benefit. The cost is not exhorbitant. In comparison with other government expenditure, the equivalent of €30 per person per year is small. When you bear in mind that the infrastructure quickly pays for itself due to reduction in health costs and saved time, there is no reason to put off starting the construction of good quality infrastructure. Over the last few decades there have been several attempts to achieve a Dutch standard of infrastructure in other countries. Unfortunately these attempts have often either fizzled out or they have been derailed by people who see themselves as pragmatic and reduce the standard of what is called for. The result each time has been that the aspirations of campaigners and councils alike have fallen so far that there is nothing remotely the quality of real Dutch ideas left. This is why attempts at change fail. For success, very high standards must be set and they must be adhered to. This website includes a public forum for discussion of childhood freedom. There are separate sections for discussing problems that people face and their solutions, to point out good examples which already exist and to point at examples of infrastructure which make a difference. The first stage of any campaign is to point out problems and raise awareness. This is what we are trying to do now. It would be helpful if you could link to us or share the link on social media. The widget on the right can be added to your blog or website. To link to us, please add the widget on the right of this page to your blog or website. Please click on "Embed this" for the code which displays this widget. We also need people to volunteer to look after local groups in the forums and encourage their use. Visit the forum to organise local campaigns and contact us if you wish to volunteer to administer the forum for your local area. Judith and David Hembrow moved from the UK to live in Assen in the Netherlands. We chose to live here because this was a wonderful place to bring up our children. Not only have our children gained freedom and independence, but so have we. It's not possible for all the world's children to move here but it should be possible for all children to live as well as Dutch children do. This requires that their parents learn what is possible and call for the same conditions for their childre. We want to help to spread the knowledge about how this came to happen in The Netherlands in the hope that other countries can achieve similar results. Who pays for this, and why ?